Finding keto snacks in indian cuisine is quite challenging, as most of them are made with pulses or wheat. So I was very excited to make a keto version of Dhokla, a typical snack from Gujrat. I made it for some guests and they all loved it - and they had no clue it was secretly healthy! The ones in the picture are very small, about half the size of the serving listed in the recipe, so feel free to adapt the size of the servings to your needs. Mix the psyllium husk with the hot water and let it sit for 5 minutes. Blend the psyllium husk mixture with the eggs, vinegar, water (start with 3/4 cup water) and oil until smooth. Add the coconut flour, salt, baking soda and turmeric. Put it in a microwave-safe mold and microwave for about 6-7 minutes or until completely set. Alternatively you can steam it. Meanwhile, in a pan, make the tadka: warm up the 2 tbsp coconut oil. Add the asafoetida, chilies, sesame and mustard seeds and fry them. Then take it out of the stove, add a pinch of sweetener if you like it. 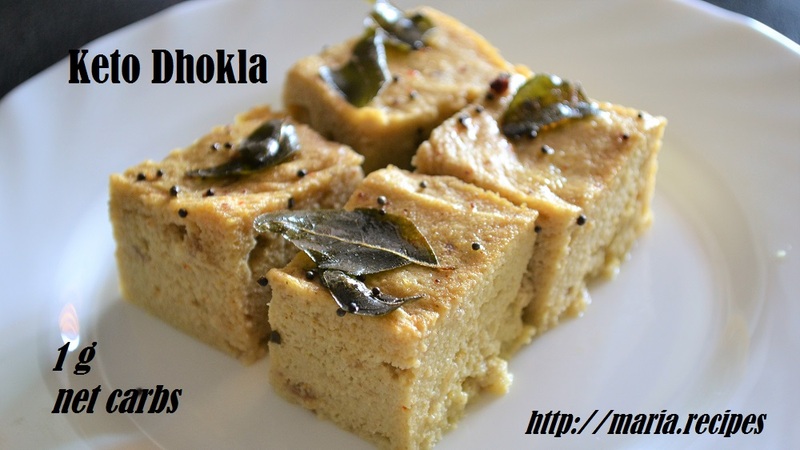 While the dhokla is still warm, pour the tadka over the top and distribute it well. Let it cool down completely, then garnish with fresh coriander, dissecated coconut and a bit of lemon juice.